BACKGROUND AND PURPOSE: Although enlargement of the cerebral ventricles plays a central role in the diagnosis of normal pressure hydrocephalus (NPH), there are no reports on the use of volumetric assessment to distinguish between patients who respond to ventriculoperitoneal shunt surgery and those who do not. The purpose of this study is to explore the association between preoperative intracranial compartment volumes and postoperative improvement. METHODS: Twenty-six patients (17 men; mean age, 75 years [range, 54–87 years]) with a clinical or radiologic suspicion of NPH were included in the study. Gait, cognition, and bladder function were evaluated by clinical rating. MR imaging of the brain was acquired at 0.5T and 1.5T. Total intracranial volume, ventricular volume, brain volume, and pericerebral CSF volume were determined by volumetric assessment. Four imaging variables were determined: ventricular volume ratio, brain volume ratio, pericerebral CSF volume ratio, and the ratio of ventricular volume to pericerebral CSF volume. All patients underwent ventriculoperitoneal shunt surgery. RESULTS: Clinical follow-up was assessed 1 year after shunt surgery. No difference in the mean ventricular volume ratio, the mean brain volume ratio, the mean pericerebral CSF volume ratio, and the mean ratio between ventricular and pericerebral CSF volume was found between subjects who improved on gait or cognition or bladder function and those who did not. CONCLUSION: Volumetric assessment has no predictive value in differentiating between NPH patients who respond to ventriculoperitoneal shunt surgery and those who do not. Volumetric assessment of intracranial compartments has been used to distinguish NPH patients from healthy subjects and to set the syndrome apart from obstructive hydrocephalus, brain atrophy, cerebrovascular disease, vascular dementia, or Alzheimer disease.19–25 In light of the important role of enlargement of the cerebral ventricles in the diagnosis of NPH, a quantitative approach of ventricle size could be useful for the selection of patients for ventriculoperitoneal shunt surgery. There are no previous reports on the use of volumetric assessment to distinguish between patients who respond to ventriculoperitoneal shunt surgery and those who do not. In the present study, volumetric measurements were performed in patients with clinical NPH to study the association of preoperative intracranial compartment volumes with postoperative outcome. The preoperative ventricular volume, brain volume, pericerebral CSF volume, and the ratio between ventricular volume and pericerebral CSF volume were quantified and correlated with postoperative improvement in gait impairment, cognitive impairment, and urinary incontinence. All patients with presumed NPH referred to our neurosurgery department between 1995 and 2001 were invited to participate. The diagnosis of NPH was made by independent neurologists from our hospital’s neurology department or neurology departments from surrounding regional hospitals. When the neurologist diagnosed NPH, both conservative and operative management possibilities were discussed with the patient. If the patient chose a surgical approach, he or she was referred to the neurosurgeon. Of the 28 patients who fulfilled the criteria of presumed NPH, 26 consented to participate in our study (17 men; mean age, 75 years; median age, 77 years; age range, 54–87 years). Inclusion criteria were the following: wide-based gait imbalance or small-stepped shuffling gait and dilated lateral and third ventricles in combination with a frontal horn index (the ratio between the maximal width of the frontal horns and the width of the whole brain at the same level)26 ≥0.40.27 Neither cognitive impairment nor bladder dysfunction was required for inclusion. Patients presenting with dementia of the Alzheimer type were excluded. Informed consent was obtained for all patients. Gait and bladder function were evaluated by an experienced neurosurgeon (R.W.). Gait impairment was rated on a 5-point scale: (0) normal; (1) slight gait imbalance; (2) marked gait imbalance but not requiring aid; (3) walking not possible without a cane or the help of one person; (4) gait severely impaired, possible only with the aid of one person on each side; (5) total incapacity for standing or walking, even with help.27 Bladder function was registered as (0) normal, (1) increased bladder urgency, and (2) urinary incontinence. Cognitive function was assessed with an extensive neuropsychological test battery by an experienced clinical neuropsychologist (H.A.M.M.). MR brain imaging was performed in all patients before ventriculoperitoneal shunt surgery. Dual spin-echo (proton attenuation and T2-weighted) images were acquired at field strengths of 0.5T (n = 7) or 1.5T (n = 19) (Philips Medical Systems, Best, the Netherlands) with 2500-millisecond repetition time, 27/120-millisecond echo time, a 256 × 256 matrix, and 6-mm section thickness with 0.6-mm intersection gap, covering the whole brain. Locally developed semiautomated segmentation software (SNIPER, Software for Neuro-Image Processing in Experimental Research) that combines knowledge-based fuzzy clustering and region-growing techniques was used to process the images.28 The outer contour of the subarachnoid space was manually delineated on each section by one observer (W.M.P. ), which was followed by an automated segmentation procedure that assigned brain tissue and CSF within this region (Fig 1). The volumetric assessment was repeated for 5 of 26 subjects (19%) to analyze the intrarater reliability. The intraclass correlation coefficient was >0.99, which indicates high intrarater reliability. We determined total intracranial volume (TICV, comprising brain parenchyma and CSF), total brain volume, ventricular CSF volume (comprising lateral, third, and fourth ventricles), and extraventricular CSF volume (EVV, reflecting pericerebral CSF volume). Ventricular volume, brain volume, and pericerebral CSF volume were converted into ratios from TICV to normalize for head size. Ventriculomegaly out of proportion to cortical sulcal enlargement, a neuroimaging characteristic of NPH,18,29–31 was quantified by dividing ventricular volume by pericerebral CSF volume. In summary, 4 imaging variables were obtained: ventricular volume ratio, brain volume ratio, pericerebral CSF volume ratio, and a ratio between ventricular and pericerebral CSF volume. 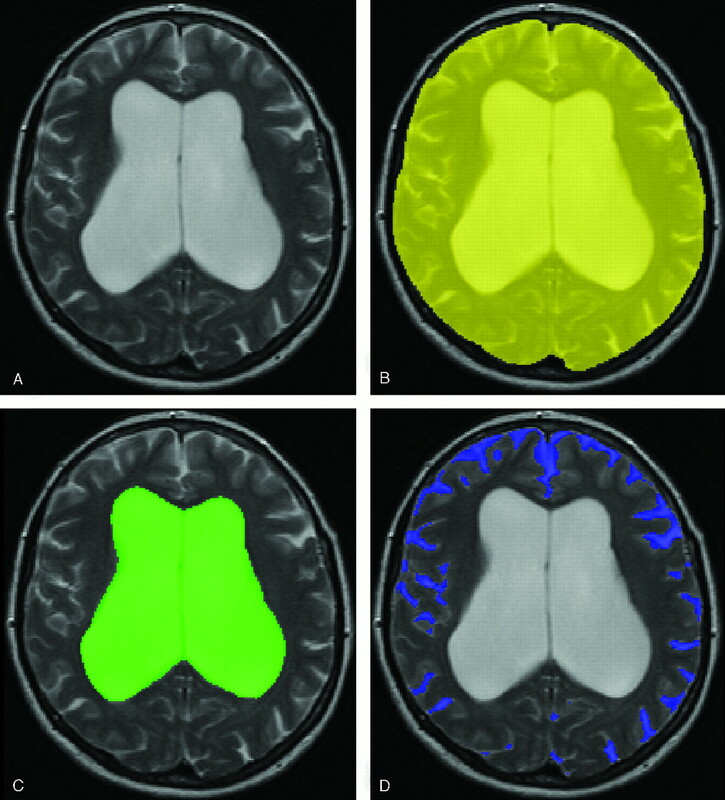 Intracranial semiautomated segmentation was based on axial T2 (A) and proton attenuation–weighted images. The outer contour of the subarachnoid space was manually delineated on each section (B). This was followed by an automated segmentation procedure that assigned brain tissue and CSF within this region. We determined TICV, ventricular volume (C), brain volume, and pericerebral CSF volume (D). All patients underwent ventriculoperitoneal shunt surgery. The type of shunt was a Codman-Medos nonprogrammable valve system with an opening pressure of 100 mm H2O. The patency of the shunt was judged by a neurosurgeon through clinical examination 2, 6, and 12 months after ventriculoperitoneal shunt surgery. In patients with lack of amelioration or clinical deterioration in combination with lack of decrease of the ventricular volume on CT or MR imaging, a surgical drain revision was carried out. The subjects remained shunted during the entire follow-up period of 1 year after shunt placement. The mean ventricular volume ratio, the mean brain volume ratio, the mean pericerebral CSF volume ratio, and the mean ratio between ventricular and pericerebral CSF volume were compared between the patients who improved after shunt surgery and those who did not. Improvement of gait, cognition, and bladder function were determined by clinical rating (R.W. and H.A.M.M. ).27 Mann-Whitney U tests were applied to assess differences between the 4 imaging variables and improvement in gait or cognition or bladder function (SPSS, version 11.5; SPSS, Inc., Chicago, Ill). Adjustments were made for multiple comparisons by using the Bonferroni method. The level of statistical significance was set at P < .05. All 26 patients had gait impairment, 22 were cognitively impaired, and 22 suffered from urinary incontinence. Clinical follow-up for the assessment of treatment effect took place 1 year after shunt surgery. Three had died in the follow-up period and were excluded from our analysis. After shunt surgery, 19 of the 23 remaining patients (83%) with preoperative gait impairment showed an improved walking pattern. Nine of the 19 remaining patients (47%) with preoperative cognitive impairment showed improved cognition after shunt surgery. Nine of the 20 remaining patients (45%) with preoperative bladder dysfunction reported a decrease in urinary urgency or urinary incontinence after shunt surgery. Baseline values of TICV, ventricular volume, brain volume, and EVV for all subjects are presented in Table 1. The means and SDs of the 4 imaging variables are presented in Table 2, classified into improvement in each of the symptoms from the NPH clinical triad. The mean of the 4 imaging variables—ventricular volume ratio, brain volume ratio, pericerebral CSF volume ratio, and ratio between ventricular volume and pericerebral CSF volume—did not differ significantly between patients who experienced improvement in gait after shunt surgery and those who did not. No significant differences were found in the mean of the 4 imaging variables between patients who improved in cognition and those who maintained the same level of cognitive impairment. There were also no significant differences in the mean of the 4 imaging variables between patients who did not report an improvement in bladder function and those who did experience less urinary urgency or urinary incontinence after shunt surgery. Our most important finding is that neither the mean ventricular volume ratio, the mean brain volume ratio, the mean pericerebral CSF volume ratio, nor the mean ratio between ventricular and pericerebral CSF volume were different between NPH patients who improved on gait or cognition or bladder function after ventriculoperitoneal shunt surgery and those who did not. Our results suggest that volumetric assessment of intracranial compartments has no predictive value in differentiating between NPH patients who will respond favorably to ventriculoperitoneal shunt surgery and those who will not. Volumetric assessment has previously been employed to set NPH apart from other conditions and healthy elderly.22,23 The technique has not been used to compare intracranial compartment volumes between NPH patients who improved after ventriculoperitoneal shunt surgery and those who did not. In one study, MR brain images were used to study the preoperative neuroimaging characteristics of NPH in relation to clinical outcome after ventriculoperitoneal shunt surgery.32 In this study, CT and MR brain images were independently evaluated in a qualitative manner by a neuroradiologist and showed an association between preoperative cortical sulci size and postoperative improvement in gait, cognition, and bladder function, whereas ventricular volume was unrelated to postoperative outcome. The finding of an association between preoperative cortical sulci size or pericerebral CSF volume and outcome was not reproduced in our study. A potential limitation of our study is that all the included subjects were patients eligible for shunt surgery. This resulted in the lack of a control group and a moderate spread of values. Nevertheless, it should be realized that our population represents a consecutive clinical group eligible for shunt surgery, which is the group that benefits most from preoperative risk stratification. In addition, if ventricular volume stays the same after the shunt is placed and the patient does not improve, a shunt function study needs to be done to determine whether the shunt is indeed functioning in light of the fact that the volume of the ventricles has not changed. Neither the ventricular volume ratio, brain volume ratio, pericerebral CSF volume ratio, nor the ratio between ventricular and pericerebral CSF volume was different between NPH patients who improved on gait or cognition or bladder function and those who did not. Volumetric assessment of intracranial compartments has no predictive value in differentiating between NPH patients who will respond favorably to ventriculoperitoneal shunt surgery and those who will not. This work has been presented in part at the Dutch Radiology Meeting, September 16–17, 2004, and the International Society for Magnetic Resonance in Medicine Workshop on Aging Connections, October 21–23, 2004.